Winning matches in Heroes of the Storm is all about understanding the different characters in the game and using each of them to the best possible effect. There are several different types of characters in the game including assassins, warriors, specialists, and support. While characters fit into specific roles, each character plays very differently from the others and that is where this guide comes in. Tyrande is a ranged support choice in Heroes of the Storm that comes from the Warcraft universe. While she plays as a ranged support character she can deal a lot of damage even on her own. She can do this with her basic ranged attack, as well as her skills and talents. She is however highly skill based to get the most out of her, since both Sentinel and Lunar Flare are essentially skills based shots. Light of Elune (Q) [6 second cooldown] – Heals yourself for a small amount or heals an ally for double that amount. Sentinel (W) [18 second cooldown] – Sends spirit owl out across the battleground. It reveals everything that it passes over and deals damage to the first enemy hero that it hits and makes them visible for 5 seconds. Lunar Flare (E) [12 second cooldown] – This ability is an AOE attack that deals damage and stuns anyone hit for 1 second after a brief delay. Starfall (R) [100 second cooldown] – This is the first of the level 10 options. This is a large AOE attack that deals damage to all enemies in it every second for 8 seconds, while also slowing them down by 20%. Shadowstalk (R) [70 second cooldown] – This is the second of the level 10 options. This ability cloaks your whole team and reveals all your opponents for 8 seconds. Hunter’s Mark (D) (20 second cooldown) – This ability marks an enemy for 4 seconds which makes them suffer 25% additional damage and blocks them from cloaking for that time. Every hero in Heroes of the Storm has several talents that they gain access to as they level in each match. Rather than look at every talent here, we will focus on the best at each level. At the first level there are a few options that really depend on your team makeup. 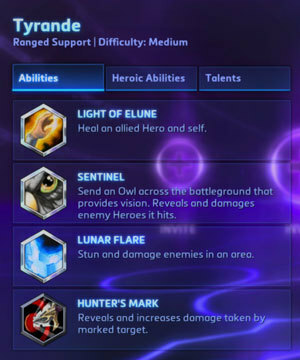 If your team has no other healer then Celestial Alignment is a good choice as it allows you to heal for much less mana, however since Tyrande’s heal is fairly weak, I would skip it and go for the damage and vision that Pierce grants, which is what Tyrande is all about. There are two good options here, and I flip between them depending on team makeup. If you have several assassin players in your group then keeping them alive through burst is a priority and therefore Protective Shield is a top pick. If your team has several high health warrior players then Healing Totem is a better choice as it provides some bigger healing options. At this level there is only one real option and that is Trueshot Aura. This talent grants a 10% boost to attack speed and damage to all nearby allies, which can mean a lot while either working lanes or in team fights. There are a few times where I would skip this talent though, and those are on Blackheart’s Bay and the Haunted Mines map, where I always consider taking the Mule upgrade to help heal up towers, keeps, and forts that take damage but are not killed. At this level you gain access to either Starfall or Shadowstalk. The go to talent here should be Starfall as it can setup a lot of kills in team fights later in the game, by dealing damage to multiple enemies at once and slowing them down for your opponents to kill. There are times though that Shadowstalk is a much more powerful option, but only when playing with a premade team that will make use of that power. The times to grab it are when playing against enemy teams that have multiple cloaked characters or when you want to play heavily aggressive and use it to setup team fights to your advantage while enemy players are out of position. This level has two good options, the first being Lunar Blaze, which increases the range and area of your Lunar Flare. This lets you help by stunning enemies more often in fights by having a bigger area affected. The other option here is Shrink Ray, which is an extremely strong talent for anyone to take. It essentially takes an enemy out of a fight for 4 seconds by slowing them and reducing their damage by 50% for that time. You can use that time to keep your group alive while killing off a different opponent or to kill off the player that you use Shrink Ray on. All of the talents at this level are useful depending on how you play Tyrande, so there really is no single option that you must take. The talent that I use most often though is Shooting Star which boosts Lunar Flares damage by 50% and refunds all mana used to cast it, if it hits an enemy hero. Your top level talents provide really good options and your choice of which to take is highly situational. If you are the only support / healer on your team then Storm Shield should be a high priority, to help keep your team alive. Depending which level 10 talent you took, will determine which boost talent you should take here that improves those earlier talents. Lastly, Bolt of the Storm is a highly underrated skill that should be considered if you are playing against a team with a lot of characters that you need to escape from. Staying alive and able to help in a fight should outrank any amount of damage or healing, and therefore if you are having issues staying alive, then Bolt of the Storm becomes the go to talent. Tyrande is more skillshot based than most other characters out there. You need to practice your skillshots and get good at them if you want to play Tyrande even half way competently. If you are missing more than 1 in 5 shots, then you will really suffer in game play, and find the character not worth the effort. Once you start hitting though, she can be an amazing benefit to your team. In the early game Tyrande should be used to help get early kills through the use of Hunter’s Mark. You will likely need to work with an ally, but with a mark and a Lunar Flare you can go a long way to finishing them off on your own. Right from the start of the game you should make sure that you start using your Sentinel on cooldown to check the position of enemies and the status of merc camps that they are likely to be trying to take. This gives your team a lot of information that you normally would not get, and helps setup fights in the right locations. Start using it early and get in the habit of using it often. Once the mid-game comes your vision of the map becomes even more important, so make sure you keep your team mates informed of what is going on. Once the late game hits, then Tyrande really comes into her own by allowing your team to pick the critical team fights to enter into or to pick of solo heroes caught by themselves. This is a massive boost at this stage in the game since death timers are so long, and any time you can take a player out of the game, it means a lot and sets up even more team fights that are to your advantage. Be sure to visit our complete Guide Portal for Heroes of the Storm for more Hero Guides, updated Tier Lists, and more. To read the latest news, features, and eSports coverage you can also visit our main Heroes of the Storm Game Page.